Volume in stocks trading is the number of shares that changed hands within a certain time frame (daily volume, 1 hour volume etc). If trader A sell 100 shares to trader B, volume is 100. If trader B sell the 100 shares to trader C then volume is 200. In classical technical analysis volume is a very important element in trading decisions. Generally, candlesticks that accompanied by high volume indicate that the stock price will continue trending short term, to the direction of the prior trend, although many times the opposite is true. Also when a stock is in uptrend with high volume and corrects downwards with low volume the chances are that it will continue up trending. On the other hand, when a stock is in downtrend with high volume and corrects upwards with low volume the chances are that it will continue down trending. High or low are defined relatively to the mean volume of previous days for a particular stock (or whatever the time frame). It is not to be taken alone as a trading criterion but only in combination with support/resistance or other technical indicators. Lately its usefulness as it is described by classical technical analysis, is in many cases disputed because of its ambiguity. The signals that volume gives depend on the certain circumstances of the price chart under consideration and the general market conditions. 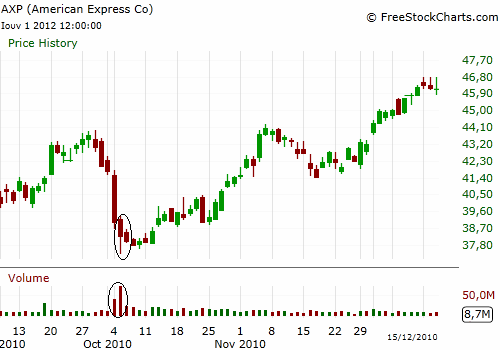 In classical technical analysis when volume is high in a breakdown, then the chances are that the price will continue down trending, just like in S daily chart (above). But it is not always the case. 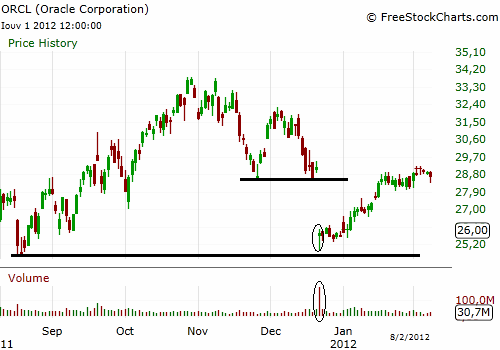 In ORCL daily chart (below), after the breakdown on support ($25) and the high volume of that day, the stock didn’t continue downwards but reversed in an uptrend. The reasons for not continuing downwards were the strong support at $25 and the fact that at the time the market was in an uptrend. 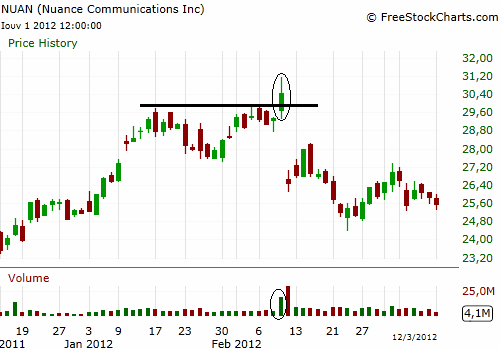 In EMC high volume in the breakout signifies the continuation of the uptrend (above). 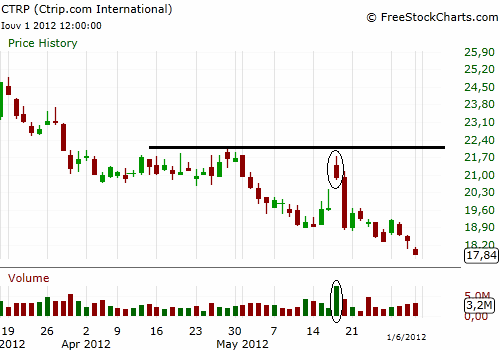 But in NUAN (below) a breakout with high volume didn’t continue the uptrend. 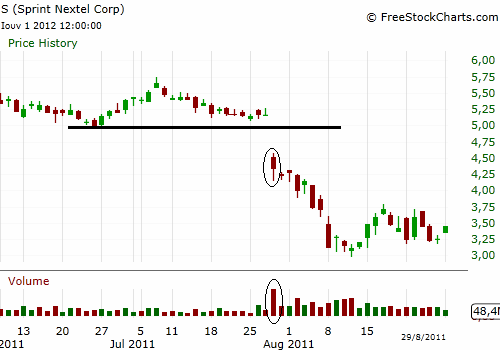 In CTRP daily chart (above) high volume signifies reversal when price revisits resistance near $22 and in the context of a downtrend. 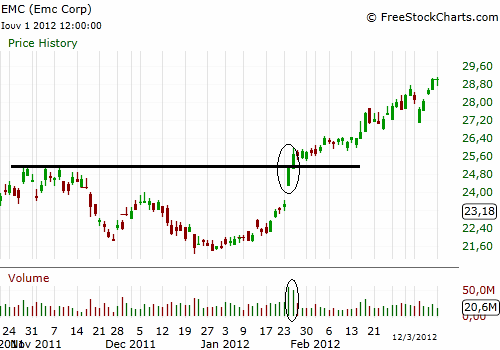 In AXP (below) high volume denotes the end of the current short term downtrend and the beginning of a new uptrend. Conclusively, someone must be very careful on how to use volume because there are much more powerful factors that affect price, like the medium term trend of the stock, the general market trend (S & P 500 for US stocks) and of course support and resistance.